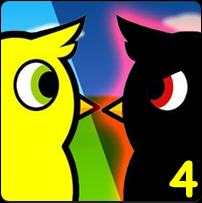 In Duck Life 4 you get to help a young upstart duckling fulfil its dream of being the best racer in the world. Use money skills to feed your duck and purchase accessories while you train him to be the best duck athlete on the planet! In this edition, the mechanics are slightly changed. You can no longer train all the skills at once. Instead, you must win a tournament to unlock it. There are new things that you can do on the farm. As you collect coins to buy food, your duckling becomes faster and more agile. Once you win your invite to the tournament, you send three of your trained ducklings out to win the championship for you! The tournaments are sets of three races in a row, without breaks. Can your ducks become the champions? Good luck!